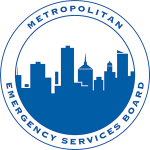 The Metropolitan Emergency Services Board was established by Joint Powers Agreement for the purpose of overseeing the 9-1-1 system in the metropolitan area of Minneapolis/St. Paul. The Board consists of commissioners from the counties of Anoka, Carver, Chisago, Dakota, Hennepin, Isanti, Ramsey, Scott, and Washington, and a council member from the City of Minneapolis. The Board is authorized to exercise authority as is necessary and proper to effectively achieve the goals and objectives of its mission. To implement the 9-1-1 plan of each county to install, operate and maintain the regional 9-1-1 system and is authorized to exercise those powers required to discharge the duties imposed by Minnesota Statute, Chapter 403, rules and regulations promulgated by the State of Minnesota Department of Public Safety, and Minnesota Statutes, Section 471.59. Adopt an annual budget, together with a statement of the source of funds. Enter into contracts or leases, required in furtherance of the mission of the Board and statutory mandate and enforce such transactions to the extent available in equity or at law. Engage in planning, installing, administering, operating and maintaining the regional 9-1-1 system. Adopt by-laws or rules and regulations consistent with the Joint Powers agreement required for the exercise of the powers of the Board or accomplishment of its objectives. The Board retains management, technical and administrative staff consisting of an Executive Director, Director of 9-1-1 Services, 9-1-1 Database Coordinator, Radio Services Coordinator, GIS Manager, EMS Coordinator, Financial Services Specialist, and Administrative support to carry out its mission. The metropolitan 9-1-1 system is one of the largest integrated systems in use today in that it provides 9-1-1 service to a nine county metropolitan area. The 9-1-1 system of the metropolitan area was planned in the 1970’s, installed in 1981 and made available for public use in December 1982. The Metropolitan Emergency Services Board, through its designated 9-1-1 Technical Operations Committee has developed a Metro Region 9-1-1 Plan for the metro area. Automatic Number Identification — a feature which displays, at the Public Safety Answering Point where the call is answered, the number of the telephone from which the 9-1-1 call was placed. Automatic Location Identification — a feature which displays the service address of the telephone from which the call was placed along with the law enforcement, fire/rescue and emergency medical service agencies that serve the displayed address. Selective Routing — a feature that routes all 9-1-1 calls to the Public Safety Answering Point dispatching center that serves the area from which the call originated. Circuit Diversity — this feature is the configuration of the 9-1-1 call delivery network using completely separate facilities so as to provide at least two paths (primary and secondary route) over which 9-1-1 calls can be transmitted. Emergency Transport Backup — where no diversity exists, this feature automatically reroutes 9-1-1 calls to a Public Safety Answering Point via the cellular network whenever normal 9-1-1 services fail. 9-1-1 Tandem Backup with Advanced Route Selection — a feature which utilizes two 5ESS digital switches to perform 9-1-1 call processing. Advanced Route Selection is the ability to continue to process 9-1-1 calls in the event of a failure of the primary route without human intervention. SYSTEM CONFIGURATION - The metropolitan area’s 9-1-1 network consists of one hundred and five (105) originating central offices of thirty-two telephone companies, two selective routing tandem switches, and twenty-one Public Safety Answering Points (herein after referred to as PSAPs). Because dedicated circuits are used throughout the network, circuits are available to receive and transmit 9-1-1 calls even if the telephone company public switched network is busy with other calls during an extraordinary high call volume event. The design of the 9-1-1 system provides a finite number of dedicated 9-1-1 trunks. This design limits the number of calls that could be placed at any one time and ensures that a single major event that would result in a very high volume of 9-1-1 calls cannot block the network or overwhelm an individual PSAP. The 9-1-1 circuits making up the network are to be installed and maintained by the telephone companies with diversity whenever such diversity can be achieved using existing facilities. If no diversity is available, an alternate means of transmitting the 9-1-1 call to a PSAP is provided. In addition, the tandem selective routing switches are configured to ensure that loss of one switch will allow 9-1-1 calls to continue to be processed through the network. STATE OF MINNESOTA - The Minnesota 9-1-1 Program, part of the Department of Administration, provides technical assistance to the cities and counties implementing, maintaining, and improving 9-1-1 systems, enforces rules that set system standards, and pays the state share of 9-1-1 costs from funds collected through a monthly statewide telephone surcharge, currently 65 cents. In 1986 legislation was passed to change the method of funding to a telephone user fee starting in January of 1987. This funding mechanism helped assure a stable source of state funds for the ongoing 9-1-1 costs, and answered local government concerns regarding continued state funding. The Minnesota 9-1-1 Program pays the state share of 9-1-1 costs from funds collected through a monthly statewide telephone fee on every wire line and wireless telephone line. The fee has been set by statute at not less than eight cents nor more than 65 cents per month in 2008 and capped at 95 cents in 2010.The Commissioner of Public Safety with the consent of the Commissioner of Finance sets the fee amount. Legislation enacted in 1994 and amended in 2003 allows the 9-1-1 Program to distribute an appropriated amount of the 9-1-1 fee to local government to help pay local cost of implementing and maintaining enhanced 9-1-1. During the early planning and implementation phase of the 9-1-1 Program, while still a part of the Department of Administration, efforts were devoted to helping counties develop their 9-1-1 plans, scheduling and coordinating cut-overs, and establishing verification and payment procedures. Further in the development of statewide 9-1-1, activity shifted away from planning and implementing new systems and toward developing and administering processes for the collection of funds, service improvements, and the verification and payment of invoices. Now that legislation has provided a funding mechanism to help cover local costs, more efforts are directed to help interested counties improve their 9-1-1 systems. There is intense interest and the technical need to modernize the old systems, and county officials have expressed satisfaction, now that they can afford to maintain their enhanced 9-1-1 systems. A consistently vital function of our efforts in the 9-1-1 field has been to maintain contact with the press, Minnesota officials, and Minnesotans in general to ensure that the 9-1-1 program is understood, and that public policy decisions which will affect the operation of 9-1-1 systems are carried out with full knowledge of that effect. The 9-1-1 program is successful due to extensive cooperation among legislators, regulators, state and local government administrators and the telephone industry. Continued success will require further cooperation to solve impending problems caused by new technology and conditions.